Made from premium high quality materials our knives are guaranteed to last for a very long time. Perfect knives for hunters, travelers and people who demand the very best knife for every day use. Our knives will stay sharp as a razor blade. PERFECT GIFT! The unique nature of our beautiful knives and the rich history of stainless steel make our beautifully designed and high quality knives a perfect gift. Stand out from all the cliché gifts and leave an impression that will never be forgotten. If you want to be a proud owner of a unique made knife and be a part of its rich history press add to cart and order our carbon steel knife NOW. If you're not completely satisfied with your purchase we'll provide you with a full refund! No questions asked 100% money back guarantee so you have nothing to lose and EVERYTHING to gain. Supplies are limited, so get your premium knife NOW. SCROLL UP & CLICK the "ADD to CART" button NOW to try out this amazing knife risk-free! FREE e-Book by ProTactical US. ATTENTION, please check your e-mail to find it in 1-2 days after the product is shipped - 100% SATISFACTION GUARANTEE - Supplies are limited, so ORDER NOW to get your premium knife risk-free! PREMIUM HIGH-QUALITY KNIFE. - High quality, strong and durable blade. Stainless steel contains more carbon, giving it excellent hardness and edge retention. It is a great tool for any hunter, camper, survivalist, outdoor sports enthusiast. 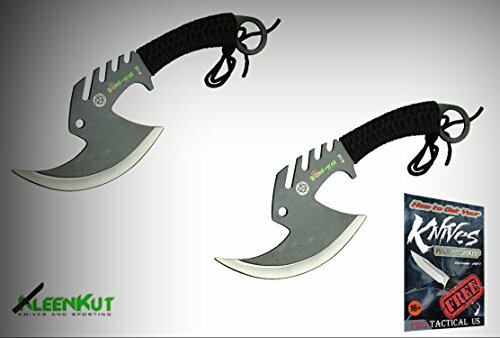 SAFE and EASY TO CARRY - Perfect for camping, fishing, outdoor adventure and self-defense. Don't forget to drop it in your backpack, it is perfect for outdoor activities. Ensure the safety and ease of use. DELICATE SIZE FOR UTILITY AND CONVENIENT USAGE - sharp, light and flat enough to stow anywhere. Designed for adventures, you can use it as a spearhead, make tent pegs, split kindling, cut small branches. OUTDOOR STYLISH APPEARANCE - Beside of the utility usage, this knife also reveals personality of the user. It is also a perfect gift. If you have any questions about this product by new, contact us by completing and submitting the form below. If you are looking for a specif part number, please include it with your message.